a member of the Indianapolis Colts. He was supposed to revolutionize the offensive line in pro football. Instead a combination of attitude, ego, injury, drug use, and bad luck de-railed the career of Tony Mandarich. However, he would find some redemption. Good thing, because he was Canadian – and he played for the Indianapolis Colts. It was when I recently watched the 1988 Rose Bowl that I recalled what was actually my biggest memory of that game. Michigan State had a young offensive lineman they simply described as “Canadian”, named Tony Mandarich. My first thought was I wondered if he was related to John Mandarich who, at the time, was terrorizing quarterbacks in the CFL as part of the Edmonton Eskimo defensive line. Unlike today, where you just Google it and find out instantly, I had to wait to get back to Edmonton where over the next few weeks, I found out Tony was John’s brother. They were both from Oakville, Ontario. 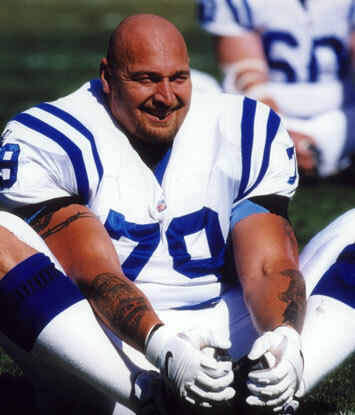 Tony moved in with John while he was going to school at Kent State, so the younger Mandarich could play a better calibre of football in the United States. That would help him catch the attention of major U.S. colleges, and ultimately a spot on the offensive line of the Michigan State Spartans. Tony was also first exposed to steroids, which would become a mill stone around his neck as his football career progressed, by his beloved older brother. Mandarich would go on to become an All-American with the Spartans. By the time he entered the NFL draft, he was considered by many to be the best offensive line prospect ever. He brought a unique combination of strength, speed, agility, and he even had an exceptional vertical. It seemed his technique was sound, and there was no weakness in his game. He seemed a can’t-miss prospect a team could build their offensive line around. He had also developed a bad-boy reputation, where he missed appearances because he was either drunk or hung over. That attracted more publicity, and seemingly added to his aura. The increasing hype, including a cover story in "Sports Illustrated", also inflated his ego. At Michigan State, Tony’s steroid use increased, as he routinely abused them to bulk up and recover quickly from hard workouts. Colleges were not testing for steroids back then. They did at bowl games, but Mandarich and other users easily gamed the system at the Rose and Gator Bowls, avoiding detection. Just before the draft, he was first exposed to prescription narcotics. It would begin a slow descent into hell. The 1989 NFL draft was one of the deepest of the ‘80s. The Dallas Cowboys, in the midst of the rebuilding program that would bring them three Super Bowls in four years, held the number one pick, using it to select quarterback Troy Aikman. Detroit had the number three pick and selected Barry Sanders, while Kansas City had the fourth pick, selecting Derrick Thomas, and the Atlanta Falcons used the fifth pick to take Deion Sanders. All four of these players are in the hall of fame. The Green Bay Packers held the second pick overall, and were roundly praised for selecting Tony Mandarich. Dallas was even criticized in some circles for not selecting Mandarich. He is still the highest Canadian-born player ever taken in the NFL draft – and routinely appears on top ten lists of biggest first round draft busts. I recall a piece on one of the sports shows that began simply with this name: Alan Veingrad. He was the lineman on the Green Bay Packers whose job would be taken by Tony Mandarich. I always remembered that every time I saw the Packers play on TV. By then I was living in res at the University of Alberta, far away from peasant vision, so I got to see a lot of football. I silently cheered for Veingrad to keep his job. Mandarich held out of training camp because the Packers would not pay what he was asking. Eventually they caved with a $4.4 million contract, making him the highest paid offensive lineman in history to that point. I had grown tired of all the hype and worse, all the attitude, so I was not too fussed when the rumblings started. Mandarich did not have good enough footwork for a professional offensive lineman. The NFL was pass-oriented where Michigan State ran most of the time, and pass blocking was not Mandarich’s strong suit. He had missed all of training camp and was not ready for the pro game. Worse still, by the time Mandarich got to Green Bay he was now hooked on pain killers. He would not start any games in his first two years in Green Bay, appearing in 14 games in 1989 and 16 games in 1990. He never was able to displace Alan Veingrad. Mandarich would start 15 games in 1991, but, by 1992, the final year of his contract, he did not even get on the field. With a new coaching staff coming on board, Mandarich was out. They did not elect to re-sign him. No one else took a chance on him either. Mandarich returned to Michigan where his drug use continued. His brother John was also dying of cancer, and doctors had already amputated his ring finger. I remember reading about that in the "Edmonton Journal". Meanwhile, Tony continued to descend into hell, failing to be at his brother’s side when he finally succumbed to cancer. Instead, he was in pursuit of his latest hit – drugs more important than his dying brother. Rock bottom approached. Finally, in 1995 he saw the light. He checked himself into rehab and got clean and sober. He was not yet 30, so the chance for an NFL comeback was still there. But would any team want him? Would it be worth the risk? trail with the Indianapolis Colts. I remember the day very well. It was the fall of 1996 and I was living in a place in Edmonton called Colorado Plaza. My Indianapolis Colts were fresh off a season where they shocked the football world as a 9-7 wildcard team, advancing all the way to the AFC Championship Game and coming within just under two minutes of going to the Super Bowl. The Colts were tuning up, and their first exhibition game was being televised. I probably still have it on tape somewhere. Anyway, I always like to pay attention to see which CFL guys are trying out, what old college favourites are playing, and who just might come up to the CFL after the last NFL cuts. Then I saw it. Listed there, starting on Indy’s offensive line was – Tony Mandarich. I honestly wondered if I heard right? Or if there was another player with that name? Or maybe it was a publicity stunt? He would go on to play in 15 games, starting six, for a Colts team that returned to the playoffs, losing again to the Pittsburgh Steelers for the second consecutive year. The next season he would start all 16 games for a woeful team. The next year, they were just as bad. Their claim to fame was they were so bad, their record earned them the number one pick in the draft, which they used to select Peyton Manning. What a stark contrast that would be. Two top two selections – one a bust leaving just as the other, who would go on to put up hall-of-fame numbers right into the present, arrived. 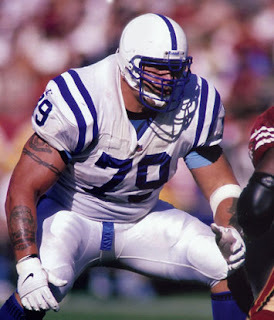 They never played together, as Mandarich was finally forced into retirement with a shoulder injury. This was after he started the Colts’ first 10 games of the season. By then, he had salvaged a bit of dignity, and put together a serviceable NFL career. Is Tony Mandarich to be commended or condemned? I’m of two minds on the matter. Initially, I was happy to see him achieve some measure of redemption when he played for the Colts. It took a long time for me to come to that point, given how much I detest cocky, arrogant athletes who have not proven anything yet. I was happy to see him fall, and cheer for unheralded, but hard working Alan Veingrad, whose job Mandarich never took away in Green Bay. In fact, Veingrad had a compelling story himself, overcoming a career-threatening injury to outperform Mandarich. However, Tony Mandarich’s fall from grace was spectacular. Not only was he humbled and humiliated, but he was deprived of everything he treasured – fame, fortune, that magnificent physique. He was exposed as a liar and a cheater, and confined to the trash can of the NFL – until he got clean and sober. It was at this point my opinion changed. In the simplest terms, he had learned his lesson. Maybe he earned a second chance. That was my thinking in 1996. Reading for this post though has provided me another perspective. Jim Irsay of the Indianapolis Colts said Mandarich damaged the game. Not only did he lie about his steroid use, but he served as a role model for young players who wanted to be like him. Essentially, he helped foster a generation of steroid users. He also used that enhanced body to dominate, humiliate, and belittle players who were clean, players who were not cheating or benefitting from performance enhancers. Yet Irsay also said Mandarich had done his penance. “His story is one of the great stories of redemption. There was a massive price he paid. But it shows that everyone is salvageable. For you, well, everyone should remember that when you forgive, you become free,” Irsay is quoted as saying in a story written by Rick Telander in Sports Illustrated. Mandarich also now wants to talk to young players and share his experiences with them. For that, he should be commended – if he’s sincere. If that’s the case, as soft-hearted as I am, I come down on the side of redemption. If nothing else, the rise, fall, and rise of Tony Mandarich is a cautionary tale for all those who come after him. Fame can be fleeting. Cheaters will be caught. There is no joy or happiness at the bottom of a pill bottle. Once someone is gone they never come back. Tony Mandarich has experienced all these things and much more. Let his life, and all those broken dreams, be a lesson to those who come to follow.